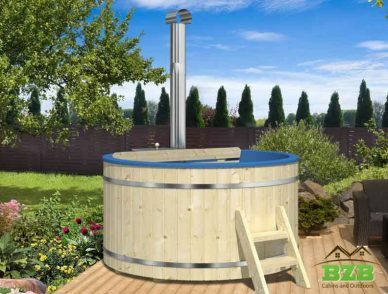 Rejuvenate your body and mind soaking in a BZB outdoor wood fired hot tubs under your favourite tree or under the stars! The healing power of natural hot springs has been known since ancient times and you can create your own personal delight with a barrel kit. 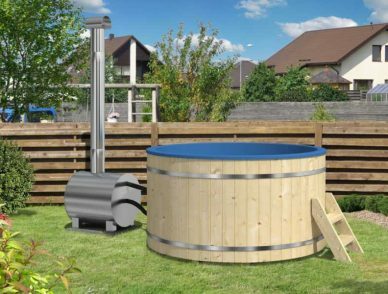 Our outdoor hot tubs come ready assembled and only require a heater to be installed. The barrels are made from the finest woods that are known for their durability, comfort and ease of maintenance. They seat four to five people and can be used all year round. The inside is fully lined with PVC, making cleaning and maintenance easy and simple. Our hot tubs are stained in a lovely light brown shade, adding a beautifully pleasing aesthetic touch to your property and blending into the natural greenery of your landscape.